A television advertisement goes: “It’s time to let Focus Factor be your memory-fog lifter.” But is this supplement up to task? Focus Factor wastes no time, whether paid airtime or free online presence: it claims to be America’s #1 selling brain health supplement with more than 4 million bottles sold and millions across the country actively caring for their brain health. It deems itself instrumental in helping anyone stay focused and on top of his game at home, work, or school. 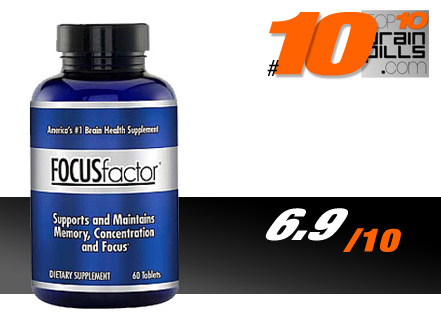 Created by Factor Nutrition Labs, Focus Factor boasts of nutrients and proprietary neuro-boosters in its formulation – a supplement that promotes patent-pending ingredients for supporting memory, concentration, and focus. It is quite evident that, basing on its bottle, Focus Factor contains a formidable list of ingredients, with good transparency in its ingredient label, quantities, and serving size. As to be expected of a widely marketed brain pill, it boasts of components that enhance cognitive areas such as memory and alertness. The label also claims that this supplement is manufactured with all-natural ingredients, meaning it contains no artificial colors, fillers, sweeteners, fragrance or preservatives. It is also said to contain no yeast, milk, egg, gluten, starch, or wheat. There is great emphasis on its natural composition. Its beta-carotene, for instance, is emphasized to be found in raw vegetables and a rich source of whole family of carotenoids. It is also said to include six different forms of vitamin C, as well as three varying magnesium sources, from malate, citrate, and taurinate. Focus Factors belongs to the elite club of smart pills that enjoy great popularity, offer a relatively reasonable price, and provide more than 40 vitamins, minerals, herbs, and other ingredients for the desired brain enhancement goals. Its slew of positive reviews and glowing customer testimonials also augment its already impressive standing in the industry. However, the devil is in the details, and we gladly obliged to trying Focus Factor out for ourselves. Overall, the buzz surrounding the product appears to be a well-deserved one, with a major number of our testers vouching for mild increases in mental acuity – particularly an improvement in their everyday focus – after weeks of using the brain supplement. The spike in memory and focus enhancement, however, seemed to be more evident in cycling the product, mostly in order to avoid building tolerance to a couple of ingredients. While this unwritten rule may apply to other nootropics in general, there is something particularly off-putting about the fading benefits of Focus Factors as weeks go by. Our results, in general, tilt in the direction of neutral – we neither sing praises nor throw bad words and comments the product’s way. And this is a rather dangerous feedback for a nootropic pill, as something usually tends to be classified into just Works or Not Works. At the end of the day, we ask the question: the ingredient lineup is A-grade, but is the overall package the best one you can purchase? One thing that Focus Factor can likely lay claim to is the general shortage of negative reviews documenting a bad reaction or a side effect. This confirms to us that the debate now is probably in the direction of its effectiveness rather than any potential adverse reaction. If there are any customer disappointments we recorded while doing our online research, it’s on how users do not feel much difference after taking it for weeks or so. Our volunteers and testers gave Focus Factor a largely positive review, and we cannot deny that with this alone a supplement can easily crawl its way to the top. Focus Factor even pays attention to the fact that a supplement alone cannot do the job; one has to follow a clean, healthy lifestyle to get maximum effects. Its promotions involve lifestyle recommendations such as feeding the brain regularly with fresh vegetables and fruits, doing a light to moderate physical routine, exercising the mind through a new hobby or interest, and to get plenty of sleep. For these reasons, our own product trial, and the lack of sufficient negative reviews to convince us otherwise, we are taking a neutral to almost positive stance when it comes to Focus Factor. It is clear to us that our winning nootropic is still (and there could be other competent ones vying for the spot it occupies), but this brain pill is worth trying just the same for you to personally see how it fares in the long term.